Addiewell is most closely associated with shale which was processed into oil at the Oil Works. But just west of the village was Loganlea Colliery (coal mine). In fact, the origin of Loganlea village was the miners' rows built by the Loganlea Coal Company for the miners at the colliery. 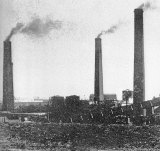 Loganlea Colliery was generally known as The Dykes - short for Muirhousedykes, the old name for Loganlea. Some Addiewell men also worked at other collieries in the area - Baads (also known as West Mains) to the south near Rusha Farm - and Woodmuir Colliery, the remains of which can still be seen at the east end of Briech village. Loganlea Colliery started at some date before 1856. It closed in 1958, one of 20 pits in Scotland to close that year as the National Coal Board tried to rationalise its operations and get rid of old and uneconomic pits. However, during 1959, as many new jobs were created in mining as were being lost - or so the NCB claimed. £4 1s 8d for an underground worker. In other words, even if a man had laboured underground for forty years, he still only got £16 6s 8d.